Amazon Red Tail Catfish 50lb. Asian Red Tail Catfish 10lb. 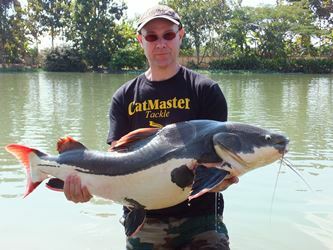 British fishing and wildlife junkie, TV personality and twice Amazon Peacock Bass World Champion Steve Townson is our professional host  an extreme angling expert with an unbridled knowledge of the Amazon basin. Thanks to Steves dedication and determination, Amazon-Angler clients from around the globe are able to enjoy the ultimate Amazon fishing holidays across South America including in Brazil, Guyana, Venezuela, Bolivia and Argentina. Our top-notch Amazon fishing vacations suit fishing fanatics, couples and families. We can take you to incredible far-flung jungle safari-style camps, or if you prefer, on luxury lodges, houseboats, yachts and barges. From your initial inquiry, Steve consults directly with you to create the perfect tailor-made Amazon river fishing vacation for your needs. A fluent English and Brazilian speaker, he will be there to meet and greet as you step off the plane at your chosen destination. His hosting skills are incomparable and you are guaranteed to return home with some unbelievable fishing tales!